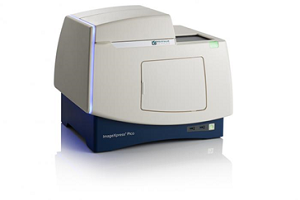 ImageXpress® Pico system combines imaging and powerful analysis for individual labs that need easy automated imaging solutions. Acquisition of images is extremely simple by just placing the microplate or sliding into the system, followed by automatic acquisition after a few clicks in the software. Results can be viewed in various formats including an image montage, bar graphs, tables, scatter plots and even videos. Export and sharing of data and images are easily facilitated with built-in sharing and remote access capabilities online via Chrome or Safari. The ImageXpress® Pico provides user-and software-selectable objectives ranging from 4X to 63X, fluorescence imaging, live cell imaging and brightfield imaging modes. The Advanced Slide-Imaging Workflow enables the whole slide to be scanned to generate an overview image that helps locate regions of interest. Users can further select multiple regions of interest at a higher resolution, reducing time and data storage space. Additional configurable options include humidity, gas and injectors. Assays such as drug compound toxicity, cell proliferation, and inhibition of cell division have a need to assess the number or density of cells in a well. 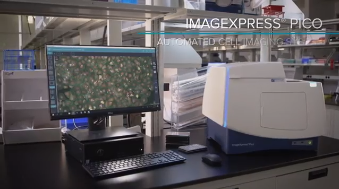 Users can simply place the sample into the ImageXpress Pico Automated Cell Imaging System and can have an automatic cell counting using a variety of methods such as label-free cell counting under transmitted light or detection of nuclear dye with fluorescent imaging. Automated imaging also provides data-rich outputs such as nuclear size, total and average cell area and intensity. Preconfigured ‘Apoptosis’ protocol template designed for easy image acquisition and analysis helps further in getting useful outputs such as number and percentage of apoptotic cells and live cells.